We're Ayrshire based designers of eye catching, responsive and SEO friendly websites. By getting to know you, your business and your needs, it allows us to focus on what's important to you, and build you a web site that both serves your needs but also reflects your personality. Our team isn't just made from Web Design Experts, we have experience in a range of fields and can support you through the process from beginning to end. We've got over a decades experience in Web Design, and have been ranked amongst the best for our Graphic Design work in Scotland. We take pride in our work, and in our good relationships with our clients. With an ever increasing quantity of internet traffic being mobile based, it is more important than ever that your website work as well on mobile devices as it does on desktops. We use the industry standard WordPress system, that creates web sites that respond to the device they are viewed on, looking as great on a mobile phone as they do on desktops. 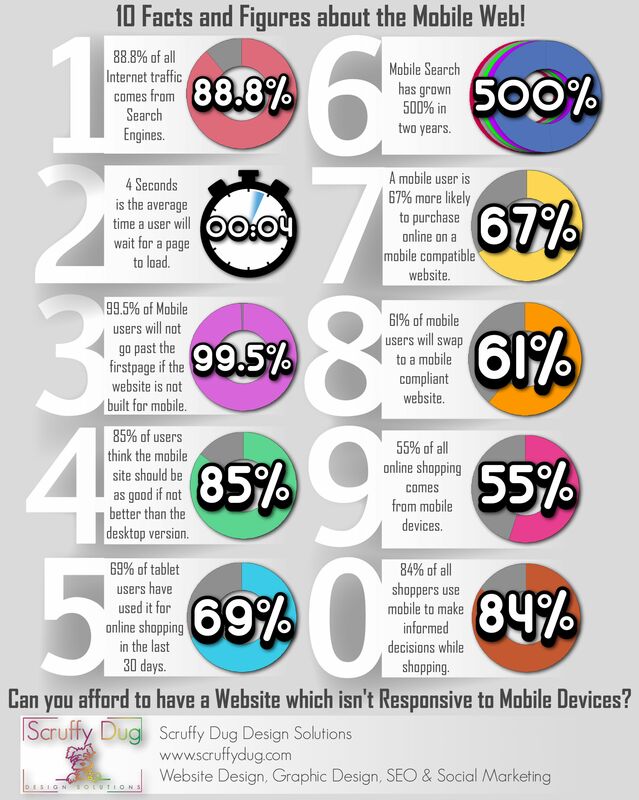 Click through the infographic on the right, to see some facts and figures about the explosion of the mobile web. For a guide to our costs, please check out our "packages" page. Our team is experienced and multi-skilled, with decades of experience in their fields, as well as being a friendly bunch. We can help you in the following fields. Web Design and Development in North Ayrshire. Responsive Wordpress Based Sites.